Can British Citizens Living Abroad Vote? “No matter how far from the UK you go, your right to vote goes with you” This is the message from the Electoral Commission in a new campaign designed to encourage British citizens living abroad to register to vote in UK elections. The campaign was launched in September, the United Nations international day of democracy. “There are fewer than 13,500 British expatriates on the electoral register, a tiny fraction of the estimated six million Britons living abroad. “Many British expats simply don’t realise that they are still eligible to vote in UK elections once they have moved abroad. But even if you are living abroad, as long as you have been registered to vote in the UK at some point within the past 15 years, you can still be on the register as an “overseas voter”. 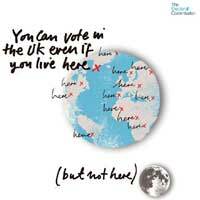 Registered overseas voters are eligible to vote in elections to the UK Parliament and European Parliamentary election. The European Parliamentary elections take place on 4 June 2009, and a UK Parliamentary election can be called at any time between now and 2010. Once registered, you can vote by post, by using a proxy in the UK or, if you are in the UK on polling day, voting in person. To encourage UK citizens not to lose their right to vote, the Electoral Commission is running a campaign with posters, leaflets and online advertising.